I’ve been searching for the perfect High Gain amp for as long as I can remember, and have played extreme metal semi-pro for over 20 years now before finding the M.I Amps ‘Megalith Beta’. It’s the 2nd of 3 amps in the M.I ‘Megalith’ range. 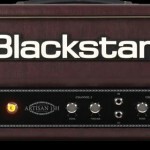 I have owned and auditioned Engl, Mesa, Hughes & Kettner, Bogner, Blackstar and Diezel High Gain amps. All great amps in their own way, but the Megalith is able to capture the great attributes of each of these amps in a single package. I currently play in d.USK, a Doom/Death Metal band. We have great emphasis on clean Melodies juxtaposed upon huge, crushing riffs. All tuned to low B. I also play in a stoner/prog. band called Wurms – a much lower gain, Eb tuned band. The Megalith Beta has the strongest low end of all the amps I’ve played, in my opinion – never muddy, and musical across the entire tonal spectrum. Interestingly, it was the first amp that our drummer felt he could hear the guitars properly. High gain amps need enormous power to push the kinds of frequencies we use and allow you to be heard. The Megalith Beta easily has that power. 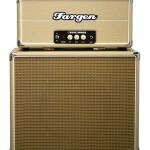 It is matched with the M.I Amps 4 x 12 that houses Eminence Wizards. Amazing combination. 2 Channel amp head (Clean and Overdrive), 160+ watts (courtesy 4 x KT88 valves) 3 x EQ voicings per channel, individual Channel EQ, Bright Switch, Attack Switch, the Overdrive Channel has a 3 position gain-stage switch for low, medium or high gain, 2 x (Foot-switchable) Master Volume , Foot-Switchable FX loop, & handles any cabinet combination. Two Contour controls (one for each channel) – these are akin to a ‘Depth’ control on amps like the Diezel Herbert. 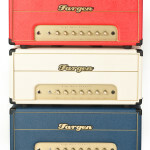 An amazing feature, as you can ‘tighten’ up or ‘loosen up’ the feel of the amp in quite a dramitic fashion. There are heaps of tonal options, but the layout is really simple to follow. All the typical controls are present for the two channels, including a number of 3 way dip-switches. The 3 Button foot controller switches from Clean to Overdrive, and there is a switchable ‘loop and Master A/B Volume switch. Very easy to use. Very easy to dial in a satisfying sound fast. I am well over the honeymoon period, yet I still struggle to find a weak spot in the amp. Aside from the fact that the Megalith is the most crushing amp I have owned/played/recorded, I have also found that the clean channel is utterly superb. Pushing the gain on the clean channel yields a gorgeous classic-rock growl that cleans up beautifully rolling back the guitar volume control. My Telecaster sounds like a Tele, the Strat sounds like a Strat, and so on. 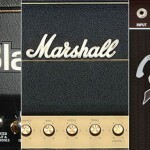 I really appreciate the fact that the amp never masks an individual guitars’ personality. So easy dial in warm, liquid fusion-esque tones in the lower gain settings too, or switching to a Medium gain and tapering back the gain pot gets great crunch tones and fluid lead tones. There’s a huge amount of scope here. The highest gain settings are simply wild – this is also the first amp that I have found that has the brute power to be heard clearly. I can have super tight high gain with absolute articulation, body and a sense of nuance to chords and single lines. 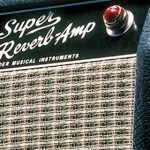 I get the feeling M.I have really tried to deliver an amp that will meet every High Gain aficionado’s expectations. I have found that a clear, high output pick-up is best suited. I’m currently using EMG 81’s, or Brierley hand-wound pick-ups. I have also found the amp responds exceedingly well to pedals. A real bonus! The E.Q is musical. Can be very dramatic but always articulate – no low-end muddiness or shrill highs. What I love is the 3 position, E.Q voicing-switch. It allows you to dial in the amp to any given environment, in conjunction with the Contour Control – be it stage, rehearsal room or studio. Extremely powerful. In performance, I have found that the Megalith allows me to have super tight low end at higher gain settings, yet that is not to the detriment of single note articulation and mid-range voicing- I can (and often do) engage the FX loop and sometimes the Master B Volume (for a boost) when I solo – but even without that, the upper octave notes on the guitar remain intact and well rounded. I find that aspect exceedingly rare in this genre. I have been using the Megalith Beta for two different bands, 2 rehearsals a week plus shows for the last 9 Months. It has never missed a beat. The build quality is superbly robust. 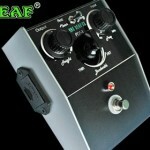 I get the impression that M.I Amplification have taken their construction ethos from the likes of Diezel and Bogner. All the components are of the highest quality, and the very thick PCB is very elegantly laid-out. 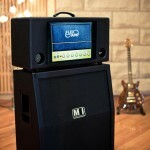 Having chatted to the guys from M.I Amps I know they take enormous pride in the quality of their products. It’s clear that I love this amp. At my age, I had no qualms in spending a LOT of money to find the amp that delivered the biggest, heaviest sound I could find, in a high quality package. 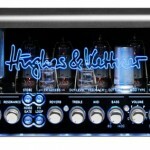 They great thing is that the Megalith Beta is FAR cheaper than many of the other amps I have owned in the past! I really like the fact that M.I Amplification are a smaller company, you deal with them personally, & you can actually speak to the guys that design and build the amps and feel that they are listening to your needs – always seeking to deliver an amplifier they can be really proud of. I simply don’t have to fuss or worry about my gear any more – I simply turn up, plug in and get on with writing/playing music! And that’s really what it’s all about. I’m now in the process of selling off my other amps. I can say I’m even more proud of the fact that they are a home-grown company – a major feat in a country with such a small population. I honestly feel that the Megalith Beta is as good or better option than any other high-gain amp on the market today. If you get the chance to try one, take it!